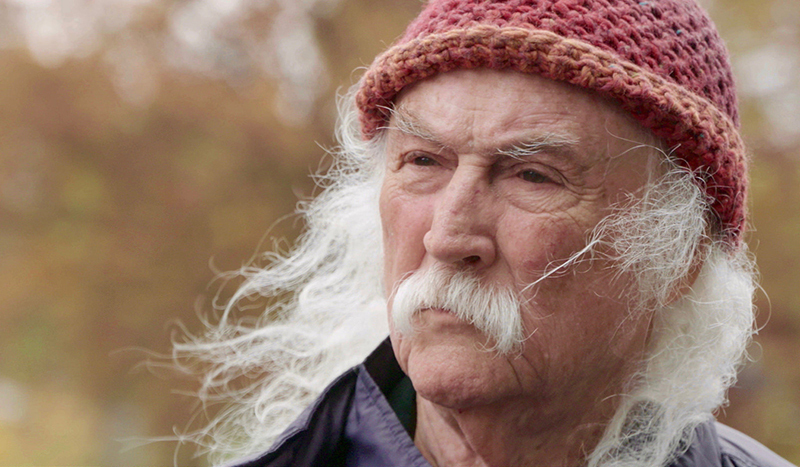 With a knit cap over his long, silver hair, David Crosby (Crosby, Stills and Nash, Crosby, Stills, Nash and Young, The Byrds) recounts his life as a rock star, recalling an instance where he was trying to keep it together after getting too high with a German prostitute named Duchess and hiding in the bathroom at a John Coltrane concert. It’s the type of story Crosby tells with a chuckle but also a twinge of regret and sadness in his eyes. As a 76-year-old, Crosby states that he has survived a few heart attacks and overdoses throughout the years, and now battles a slew of health problems, wondering how he’s managed to stay alive until his 70’s. However, he’s still making the most of his time, creating his own “musical renaissance,” having put out four albums in his 70’s and singing and playing guitar with as much resonance and passion as he did in his formative years. David Crosby: Remember My Name has the strength of an incredible soundtrack to choose from, as well as incredible, sepia-toned archival footage from a time linked with some of rock music’s most recognizable legends such as Joni Mitchell and Bob Dylan. Legendary music journalist Cameron Crowe not only produced the film, but interviews Crosby on some of the most intimate and painful details of his life, probing the mind of one of the most turbulent, yet talented rock stars in history. One aspect of this relationship that I found particularly interesting was Crowe’s way of getting Crosby to really elaborate on his own sense of guilt in the relationships he has damaged over the years, particularly with his musical partners, Stephen Stills, Graham Nash and Neil Young. In particular, Nash and Young cite their reasons for not wanting a Crosby, Stills, Nash and Young reunion over their personal feuds with Crosby, and one scene where Crosby, Stills and Nash butcher a rendition of “Silent Night” at the White House Christmas Tree lighting ceremony shows how disjointed their once harmonious partnership had been. The dissolution of his friendships is foreshadowed early when Crosby recounts his being fired from The Byrds—he simply admits that he was “a difficult cat” to work with. For me, the forthcoming honesty in Crosby telling his own story comes from a combination of Crowe’s intense questioning and Crosby’s willingness to tell all. Director A.J. Eaton opted to structure the documentary around Crosby’s own words instead of a bunch of other “talking heads” to tell his story. It was clear that the pain is still fresh for Crosby when he talks about his first love, Christine Hinton, dying in a car wreck, or learning about the shooting at Kent State, which later inspired Neil Young’s song “Ohio,” or his friendships with his fellow musicians falling apart in recent years. Crosby does not sugarcoat his mistakes when he talks about his struggle with drug abuse, or talks about how he should have treated the people in his life better.